I'm using Vivado 2017.4 on linux. The Nexys Video HDMI project was made to work with VIvado 2016.4. The vivado version makes a difference. To use this project in Vivado 2017.4. You should first double click on cleanup in the project folder of the project. Next make sure that there is contents in the repo->vivado library folder. Then use the tcl script to load the project into vivado 2017.4. Next click on tools->reports->report ip status and click to upgrade and upgrade/generate the IP cores. Next change the ddc_sda_io to DDC_sda_io and ddc_scl_io to DDC_scl_io in the xdc. This is done because the pin names changed when we updated the DVI2RGB IP core. Then create a wrapper and generate a bitstream. so it looks like I may need to just need to do the name changes. example to work through and try to understand the processes and logs. I picked this one because it has a fair bit going on I can learn from. I just started using the Nexys Video with Vivado 2017.4 on Linux Mint inside a Virtual Machine and I was able to generate the bitstream following your steps. However, when I try to program the device there is a message ""There are no debug cores" and the device cannot be programmed. I tried to refresh the device but nothing happens. I have no idea what is going on. Could you please help me? After generating a bitstream in vivado you should be exporting the hardware including the bitstream and then launching SDK from the File tab. Once SDK has opened import the applications, program the fpga and run the application by right clicking on the application and selecting run as -> launch on hardware(system debugger). 1) Please attach a screen shot of the errors you are getting in SDK. 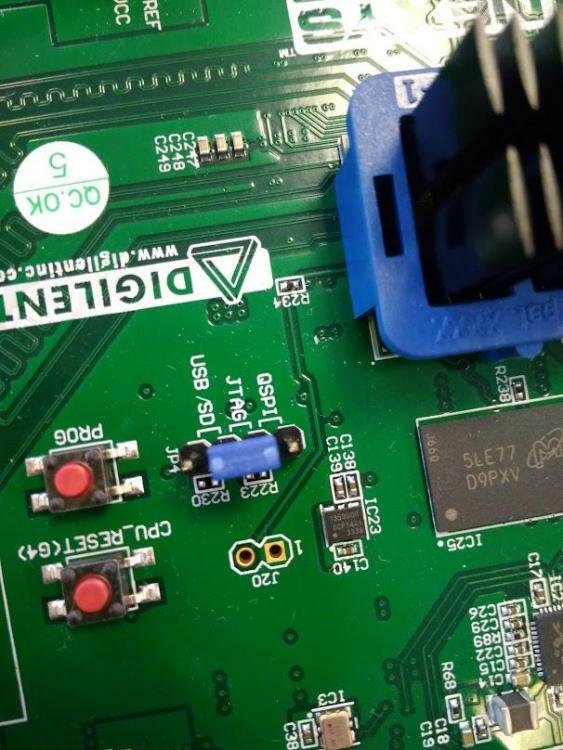 2) Do you have the Mode jumper JP4 set to JTAG? thank you for the reply. After proceeding as you mentioned this is the screenshot that I got in SDK. And t he JP4 is in the mode according to the picture enclosed here. There are errors in videodemo and videodemo_bsp folders. Is the usb micro B cable connected to the prog connector(J12) on the Nexys Video? 1) Are you able to open Vivado hardware manager from the vivado start page and connect to the Nexys Video? The cable drivers do not get automatically installed in linux when you install Vivado. 1) Here is a xilinx AR showing how install the xilinx/digilent cable drivers. If you have not already. Make sure to be root. 2) Make sure that you have added yourself to the dialout group. Here is a forum thread that shows how to add yourself to the dialout group. 3) Please download Adept 2 here. a) Use Adept 2 from the command line with the command "djtgcfg enum" . What is the terminal text response? 4) Were you root when you installed Vivado? Here is an older tutorial Nexys Video - Getting Started with Microblaze that is a much more basic project that might be easier to use for trouble shooting this type of error. 18:12:23 ERROR : (XSDB Server)ERROR: [Hsi 55-1450] Error: running generate_bsp. I am still trying but have no idea how to fix these issues. I do appreciate your help. I just would like to tell you that I was able to run the SDK and the board in running the code. The solutions was installing the ia32-libs (apt-get install ia32-libs). I am glad the installing the ia32-libs fixed the issue! Thank you for sharing what you did to get this fixed.